Financial Planning is our premier service and aimed squarely at people who are serious about taking control of their money. Is that you? You will define your financial goals. You will discover how realistic those goals are. You will gain a new insight in to your spending. You will be able to measure and track your progress towards your financial dreams. You will get an understanding of the risks associated with your current finances, and of your future plans. You will understand the effects of your financial deciscions. You may uncover financial mistakes you are currently making. You may uncover new ideas to maximise your money. You will gain the knowledge and the control necesary to build your wealth. You will be in charge of your finances, they will no longer be in charge of you. 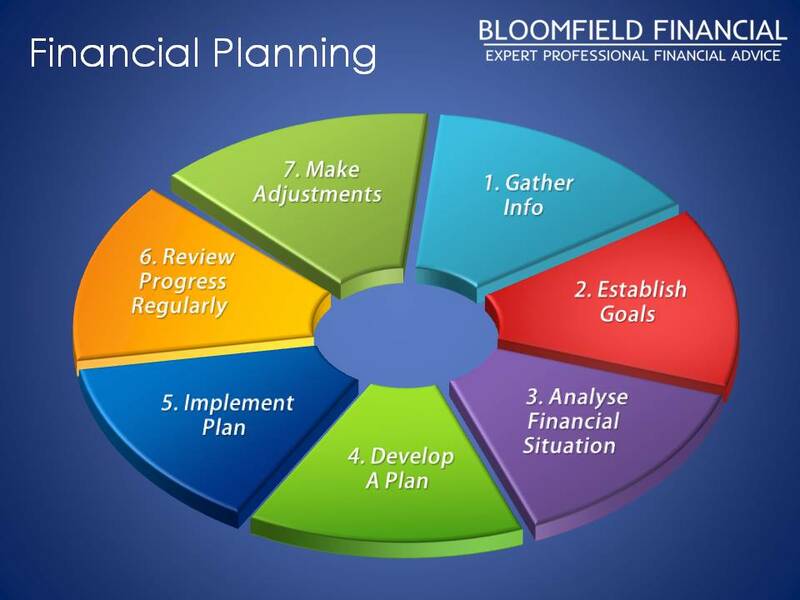 The financial planning process is an ongoing one as illustrated in the diagram above we follow the 7 steps outlined, at regular pre-agreed intervals to ensure that you are always on track and if your priorites change then your plan can change. A good financial plan evolves as you do and is never set in stone, so regular monitoring is essential. Gather all your financial information together, and set it out in an easy to understand way. Establish your priorities, goals and needs. We need to establish what matters most to you. Analyse your current financial situation. Develop a plan to get you from your current position to where you want to be. Put the plan in to effect. It could take you years to achieve your financial dreams so it is important to regular review all of the first five steps. As you progress through your plan and your situation changes, so might your priorities and your plan needs to change with it. Make any amendements to your plan as and when necessary. If you are someone who wants to take control of your finances then get in touch today for a FREE initial consultation. You can call on 0191 4066453 or use the form on this page to send me an email.